Places to Paddle showcases 60 kayaking and canoeing destinations from Noosa to Brunswick Heads and west to Toowoomba. Gerard and Tina have over 20 years' experience in white water kayaking, sea kayaking and river touring. Includes more than 20 colour maps and information on itineraries, equipment and much more. The majority of locations in our book are within a 2 hour drive of Brisbane making them suitable for weekend day trips. Our book is a detailed paddling guide and includes more than 20 colour maps and information with itineraries and much more. 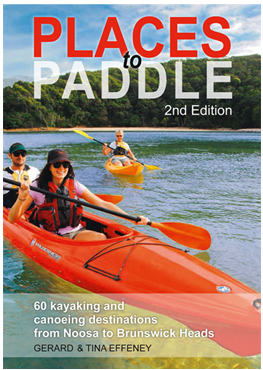 We would love your feedback on our book or please feel free to contact us with your enquiries on paddling and kayaking. Mary River, Maroochy River, Wivenhoe, Brisbane River, Moreton Bay, Stradbroke Island, Moreton Island, Broadwater, Currumbin, Brunswick, Clarence River.